The Fellows' Club was formerly Building "A" of the Security Benefit Association Complex. It was built in 1918-1919 and housed the orphaned children of members of the Association. It was called the Children's Building or the Orphan's Dormitory. At first it also housed old people until their quarters Buildings "B" and "C" were completed. In 1942, the last child had been moved out and the building was closed. In 1950, when S.B.A. 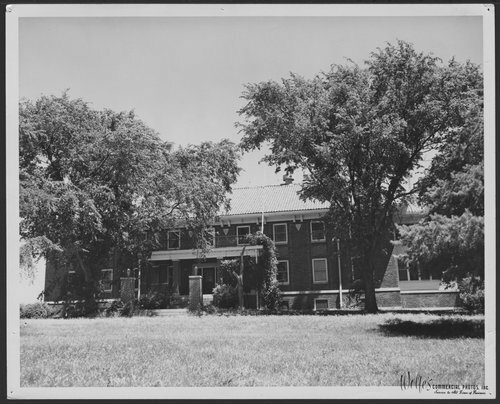 became a mutual rather than a fraternal insurance organization, the building was renamed "Hilltop Lodge" and served as a hotel for visiting families of patients at the S.B.A. hospital. The Menninger Foundation purchased the property in 1959 and in 1962 the basement was remodelled as the Fellows' Club of the Menninger School of Psychiatry. Later the building was remodelled to serve as a Day Hospital for the Menninger Clinic West Campus and was named the Clevenger Building. In 2003, the Menninger Foundation moved to Houston, Texas. Fellows' Club, Menninger West Campus, Topeka, Kansas - An exterior photograph of Building "A" / Hilltop Lodge / Fellows' Club / Clevenger Building.